Ice cream is one of life’s simple pleasures… and there’s always a good reason to treat yourself to a scoop (or more!) from Wendy’s Milk Bar. Have it in a cone, waffle cone, cup or even on top of one of our delicious MegaShakes. 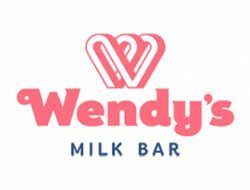 With so many delicious flavours to choose from, there’s something for everyone at a Wendy’s Milk Bar. Got a special occasion coming up? Why not order a custom made ice cream cake. And.. don’t forget our hot dogs and fries for a tasty treat!